I have not posted much in the past weeks. I suppose a lot of that is for all the right reasons. Our life is moving on from the fire that took our house and we have things to do and places to be. Places other than in the ash. The ash is consigned to last year. Every once in a while I see a bit drift by but it is the wind chasing something that was then, but not now. We are now at three weeks past the first year after our house died. Nothing has changed about the fact that the house burned and that we lost everything that was not in the mini van. Nothing has changed about who we are as people at the core of us. A lot has changed about the way we live in the world. I am happy to say that we have changed in predictable ways We are older (that had to happen!) and we own different stuff. We have a different place to lay our heads when we go to sleep at night. We still sometimes get confused when we are looking for something and cannot find it. The searching is different though. We are not searching for something that is lost to us but something we cannot remember where it is. Sometimes it is because we put it in the other room and forgot. Sometimes it is because we forgot it burned. The fire was then. Like any “back then” the memory can get a little muddled so we may have to stop and sort the chronology. Nonetheless, the fire is back then. It is not on the second hand of our life clock. The immediacy of the fire for us is gone. There are moments when it pops up, fresh and tangy with smoke but they are rare. Getting past the first year mark was both important and not important. We discussed and then intentionally scheduled a pleasurable, forward-looking activity for the time of the anniversary. We talked about the fire. We remembered that it was a year. On the one year anniversary day of the fire we talked about it in the morning and went on with our forward-looking activities. Around noon we noted the time. Around 3:30 pm, about the time we understood the fire was bearing down on us a year ago, I looked at my watch and thought about it. A couple of hours later I realized that the moment in time when our house died had passed and i had not noted the moment. On that anniversary, I had spent my time not ignoring the fire and its implications but firmly grounded in the life that we had a year after the fire looking forward doing things we enjoy. It felt good. It was not an afternoon of recovery from loss but an afternoon of anticipation about how our lives will be in the coming years. We thought about fishing. We thought about gardening. I did not think about my lost garden as being lost. I thought about the fact that I liked to garden and the garden I am going to grow when we are resettled. It is curious to me that others still react to our fire strongly when they learn of it. Today I had a meaningful discussion with a person who was distressed by learning of our fire. I had to stop to let her do the emotional processing of trying to take it in. I forget that I have already processed it and it is my history. When others learn of it, it becomes part of their experience because they know me. They comment that they had heard about it on the news or read about it in the newspaper but they have not meet someone that it happened to. The gulf between “it happens” and “it happened to someone I know” is enormous. Thinking about disasters as out there in the world and that they are bad and it makes me sad is very different than trying on the idea that it could happen to me. This is an important tenet of psychological theory. When things are personalized we more linked to them. That linkage makes us feel strong empathy; it builds a bond between the person who experienced the event and us making the event more real. It is the same principal as a political campaign. If you can build a strong link between the candidate and the voter, the voter is more likely to vote for that candidate. It works in advertising too. Advertising a product aimed at youth by having older adults expound on its worth is typically less successful than appealing to the target market so that the product “speaks to them.” The intended customer can imagine themselves with the product. People we meet, because they have met us and we are like them, can imagine themselves with their own fire. Sometimes people ask me for advice, what did I learn from the fire. I usually tell them to look at their lives and see how they live them and what is important to them. If it is important, take steps to protect it in a way that makes sense to you. Most often people tell me they have or plan to back up all of their computer data and store it some place safe. Cloud computing seems to be quite popular among people who know us. Other people I have spoken to tell me of their love for a particular letter or family document. I have encouraged them to make copies so that they can have it close but also find an additional place to put a copy. It is highly unlikely that two places will both burn down. When I was in graduate school one of the people I knew kept a copy of his-in-progress dissertation in his office, one at his home and a third copy in the car so if his home and his office burned he would still have a copy in his car. He finished his PhD with no fire. As I type this I am smiling thinking of the car safeguarding his dissertation and the treasure trove the red mini van was for us after our fire. Unintentionally the van protected some of our things. All of the detritus you intend to get out of the back of the car but don’t was a jump-start on rebuilding. I still best like the fact that we found 2 1/2 pairs of hiking boots. I have spent time thinking about how we had 2 1/2 pairs of boots. Might I have gotten out of the car with one shoe off and one shoe on, kicked the one that was on, off at the back door and scooted in trying to avoid spreading mud? Did it fall out of the door of the van when several of us unloaded and had hiking gear spread out? Did I absentmindedly put a pair of boots in the car that was not a pair and somehow tried later to match pairs and one boot escaped my view? Is the other 1/2 pair of boots hanging out in the van and I have just not found it yet? It does not matter. In truth, I cannot remember for sure if there were 2 1/2 pairs of boots. Maybe there were two pair. Maybe three. Now we have new detritus building up in the red van. We still keep boots in the car. Our family shoe-pile is not as big as it was but it is not inconsequential. We don’t line them up each night checking to see if we actually have shoes. We have shoes. We have plates. We have two benches, two kitchen table chairs, an easy chair, an ottoman and a couch. We have dish towels. We have the jumble of mugs that grows unbidden in the cabinet above the coffee pot. 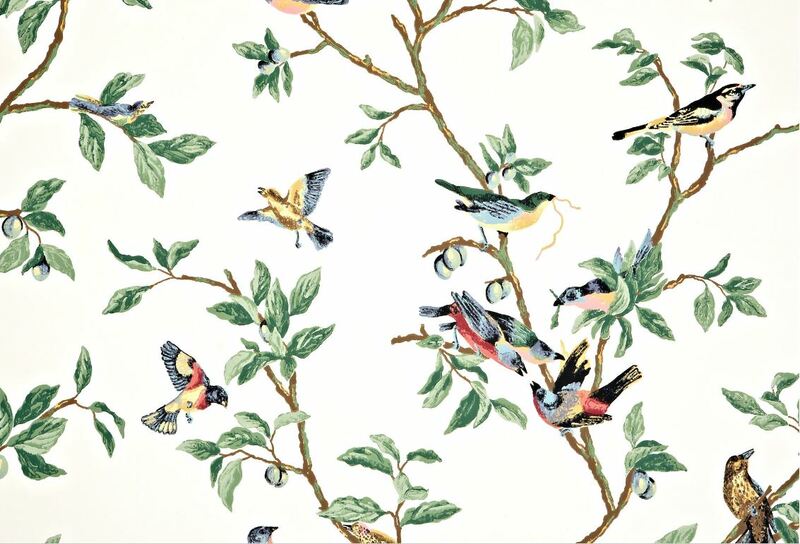 We have little birds wall paper. We don’t have a house. We are not what the insurance company calls “resettled.” Inside of us, though, we are settled and our home is restored. This home that is us does not yet have a house but it will. It is good to be a home and it will be good to have a house for our home.